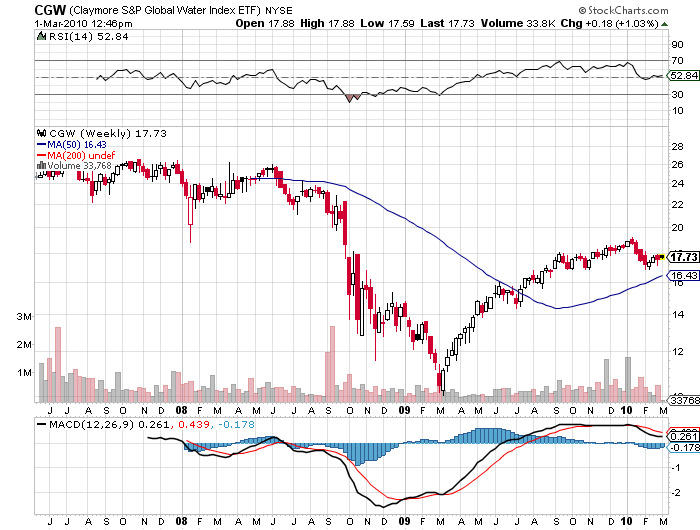 If you think that the upcoming energy shortage is going to be bad, it will pale in comparison to the next water crisis. Investment in fresh water infrastructure is undeniably going to be a recurring long term investment theme. One theory about the endless wars in the Middle East since 1918 is that they have really been over water rights. Although Earth is often referred to as the water planet, only 2.5% is fresh, and three quarters of that is locked up in ice at the North and South poles. In places like China, with a quarter of the world’s population, up to 90% of the fresh water is already polluted, some irretrievably so with toxic heavy metals. Some 18% of the world population lacks access to potable water, and demand is expected to rise by 40% over the next 20 years. Underground water sources in the US, like the Oglala Aquifer, which took nature millennia to create, are approaching exhaustion. 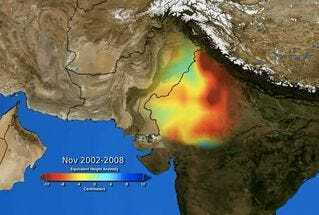 Take a look at the photo below, which I pulled off the NASA website, showing dramatic falls in the water tables in the largest food producing areas of India and Pakistan, as measured by the Gravity Recovery and Climate Experiment (GRACE) satellite. While membrane osmosis technologies exist to convert sea water into fresh, they require 10 times more energy than current treatment processes, a real problem if you don’t have any, and will easily double the end cost to consumers. While it may take 16 pounds of grain to produce a pound of beef, it takes a staggering 2,416 gallons of water to do the same. The UN says that $11 billion a year is needed for water infrastructure investment, and $15 billion of last year’s stimulus package was similarly spent. It says a lot that when I went to the UC Berkeley School of Engineering to research this piece, most of the experts in the field had already been retained by major hedge funds! 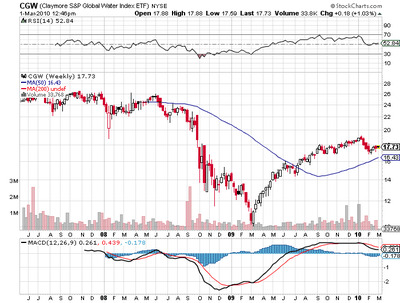 At the top of the shopping list to participate here should be the Claymore S&P Global Water Index ETF (CGW), which brought in a positively effervescent 46% return in 2009. You can also visit the PowerShares Water Resource Portfolio (PHO), the First Trust ISE Water Index Fund (FIW), or the individual stocks Veolia Environment (VE), Tetra-Tech (TTEK), and Pentair (PNR). Who has the world’s greatest per capita water resources? Siberia, which could become a major exporter to China in the decades to come.